I really was in a pink-purple mood! Actually I expected a couple of them to be a little different (257 seemed more "lilac", for instance) but I'm really eager to try them on! Si vede che ero in giornata rosa-viola!! Qualcuno è abbastanza diverso da come me l'aspettavo (il 257 sembrava più lilla) ma non vedo l'ora di provarli!! @Alice alla fine oggi ho un CG blu!! Ma da domani swatcherò i Kiko! @xnosugaraddedx: they're still waiting for the right purple/pink mood, today I was in a blue one ;-) but it will come soon! @Shiny: thank you! 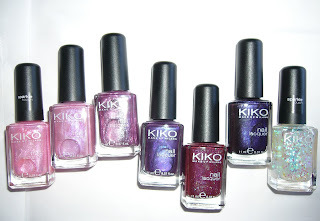 Purple is my favourite colour, I often buy purple/lilac polishes!